As far as most specialists agree on reading is the best way of gaining knowledge, professors assign critique writings to students on the regs. Such tasks allow enhancing the brain functions and critical thinking, encourage youngsters to read books, and help them shape an opinion on literary works. A critique of a novel is a type of college papers that gives a critical assessment of literary works. It’s a systematic analysis discussing a book’s validity and evaluating its worth. A critique is not about information but analysis and persuasion. An introduction with a clear thesis statement. A body with your synopsis and arguments. A conclusion with your points summary and thesis restatement. One can’t simply sit and write an essay. (Okay, our writers can.) 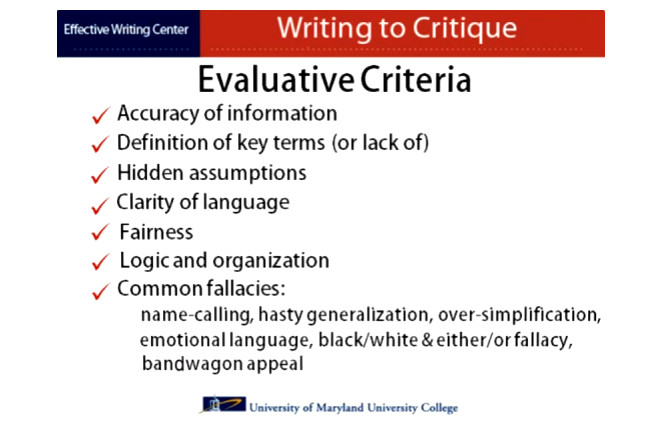 To come up with an A+ critique, be sure to consider the following steps. No matter if it was a teacher who assigned a particular novel for you to criticize or you had a freedom of choice here, you’ll need to do research and create a detailed outline before writing a critique itself. Say you’ve got a book to criticize in your essay. What’s next? While reading, write a brief summary for each section. Determine the author’s core statement. Read some reviews of the novel to get a better idea of its content and message. Come up with 3-5 arguments for your thesis. Search for relevant references to support your thesis and arguments. 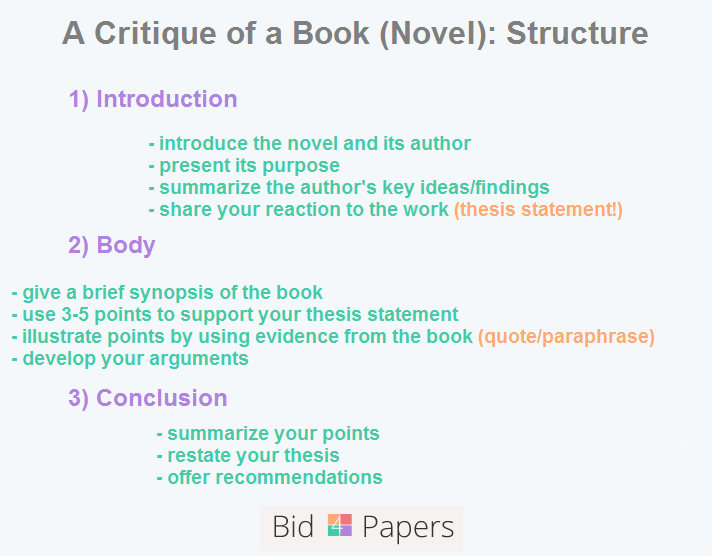 Find evidence from the novel and write a detailed outline of your critique. To smooth things down for you, we’ve prepared the free checklist of questions you can use as a guide for writing a critique. Get it right now to make sure you haven’t missed anything. Once your research and outline are ready, it’s time to start writing the first draft of your critique. Be sure your outline relates to the thesis, and you’ve organized each section coherently. The easiest part of writing, an introduction contains basic information about a book: its author, title, topic, and key ideas. Also, present the essay purpose and your reaction to the novel: the latter will be your thesis statement. Sentence 1: A book’s author + its title + the main idea. Be objective and use so-called evaluative verbs to power your writing. Sentence 2: A book’s summary + its aim (key argument). Keep it neutral and try avoiding specific details. Sentence 3: A brief statement of your evaluation. The transitional thesis is the last sentence of your introduction, and it can be positive-positive or positive-negative. Depending on a literary work you criticize, the essay introduction may be 1-2 sentences or… 1-3 paragraphs. No strict rules exist for the number of paragraphs you should write in a critique’s body. It depends on your assignment’s specifics and a novel you need to evaluate. Taking a standard 5-paragraph essay as a basis, let’s say your critique will consist of three paragraphs. Organization. Depending on the approach, you can arrange paragraphs by points, strengths vs. weaknesses, or theme. Remember that the aim of your work is not merely criticizing a book in a negative way but also point out what its author did well. Writing techniques and style. Evaluating a novel, don’t forget to mention these points. Discuss how effectively (or not) the author used stylistic choices to promote his/her ideas. Evidence. Describe what types of arguments the author used. Were they logical and appropriate? Don’t forget to explain why the evidence supports your point. Usefulness. Discuss what the novel adds to its topic understanding. Is it overall useful? Does it present ideas in original and engaging ways? How does it consider key concepts in society? Examples. You should support each point of your critique with examples. For instance, you can’t simply write that a novel was dull but provide a quote as evidence and explain why it does not appeal to you. Language patterns you use for writing a critique matter, either. Be sure to use reporting verbs and phrases, modality, and concessive clauses. The final part of your essay, this is a paragraph where you summarize and qualify judgments, as well as offer your recommendations on a book. Do you agree with the author? Why, or why not? What is the overall opinion on this novel? Be specific. Remind readers the importance of a literary work you criticized, focus on its strengths and weaknesses, and state what you believe is its ultimate success. Here comes the critique’s sample, kindly provided by OWLL for you to understand the specification of such tasks. And don’t forget about one more detail able to turn your essay into an A+ academic paper. Content and grammar are of equal importance here. If a reader doesn’t understand your sentence structure, they won’t be able to follow your argument. That’s why revise and proofread your essay but don’t rely much on spell-checkers, as they often miss even the most obvious spelling mistakes. Instead, ask someone to proofread your work and revise it accordingly. Or, contact our editors for help.